I’m a big fan…of fans! No RV is complete without some 12V fans. They move the air, help keep you cool, and even work when you don’t have electrical hookups. I always have one or two small two-speed 12V dash fans mounted in strategic locations in the RV. These fans can be found in most auto parts stores and RV parts stores. They are great for circulating cool (or warm) air inside your rig. They draw little current, and can be pointed at the exact spot where you need a little breeze. 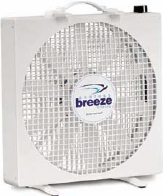 For bigger cooling jobs, check out the “End-less Breeze” 12V box fan, made by FanTastic Vent corporation, the same folks that make those excellent powered roof vents. Using their proven technology, this little fan (it only measures about 14 inches square, and is just 3.5 inches thick) re-ally moves some air. It works well set in a window to either bring cool air in, or exhaust warm air from the rig, and, even on the high setting, raws less than three amps. It also makes an outstanding mosquito deterrent when you sit outside in bug country. When not in use, mine stows easily in a cabinet. Finally, one of my least favorite tasks is defrosting my RV refrigerator. However, with a small plastic battery-powered fan, you can make this task a breeze. I’m referring to those little “personal fan” gadgets that sit on your desk and run on a couple of D cells. To use the fan, relocate all the items on the top shelf of your fridge to lower shelves. Turn off the fridge. Place the fan on the top shelf where it will blow air directly on the cooling ﬁns in the fridge compartment. Now turn it on and close the door! The fan will cause that frost to quickly melt away, and the food in your fridge stays adequately cold. Don’t forget to turn the fridge back on when you’re done. o defrost the freezer, turn off the fridge and relocate all the frozen items into the refrigerator compartment. Now prop the freezer compartment door open and place your trusty little fan to blow air into the freezer. It’s amazing how fast this works: on a warm day it will only take an hour or so to loosen all the accumulated frost and ice. Keep an eye on it so that the melt water doesn’t overﬂow and make a mess. After the ice is gone, dry the inside of the freezer compartment, close the door and turn the fridge back on and set it to ‘Max’. Once the freezer cools back down, you can return all the frozen items. Remember to turn the fridge down to the normal setting.